Meet Jax, a dog we have been honored to have known for years. We watched Jax romp and play without even glancing over his shoulder in puppy school every time his dad said his name: and worked really hard to teach him NOT to scale trees after EVERY squirrel in the neighborhood. We taught him to not counter surf after he indulged in an entire tray of macaroons; then, we comforted him when he needed us most. Read on to find out why this big, beautiful face does not even tell a sentence of Jax’s life story. Jax came to me with his brother Opie when my now husband, Mike, whimsically decided he was ready for not one, but TWO puppies! Jax’s enormous size and loud, intense bark can be very intimidating to people who do not know him. Many folks assume that he is aggressive or that he is going to hurt them simply because he is a big boy who likes to talk. And talk. He is VERY needy for affection and attention. Jax thinks he is a lap dog and will follow anyone who is home; he likes to lie down wherever he needs to so that he can keep close tabs on what any one of his family members is doing. Our giant marshmallow of a boy is also VERY whiny and vocal when he feels we have not engaged him as much as his heart desires at any given moment. Big, sad puppy eyes staring me down while I try to work? Quite the opposite of frightening. We lost Opie, Jax’s brother, when the puppies were just 6 months old. Jax was debiilitated by grief when Opie passed; perhaps more so than we were. He refused to eat treats or play any of the fun games he normally loved during a subsequent session with his trainer. But, instead, laid lethargic in her lap while she softly stroked him and let him mourn the loss of his littermate. We allowed Jax’s heart to heal in his own time. But, did LOTS of special activities, extra walks, fun training games, and made additional trips to the dog park to help nurse his puppy soul back to our squeal-like-a-teenage-girl when he sees someone he knows and loves self . When Jax started to come through the gloom, he was an entirely new dog. 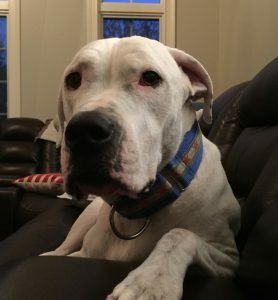 Jax became more engaged and affectionate with me and my husband than he was when he had a puppy partner in crime; and, his previous selective hearing and aloof attitude seemed to have disappeared. My one-on-one relationship with him has continued to blossom. And, Jax is still my constant companion today; even as we have welcomed not one, but TWO human babies in the last three years. I love PEOPLE but can be weary of DOGS! Please ask if your dog can say HI! Jax is a special dog. He gets annoyed. He gets frustrated. He gets scared. He gets lonely. He forgives me when I am distracted and I forgive him when he tries to bolt after the deer in our yard. He is my most constant companion and we understand each other probably better than I understand my human kids. We look out for each other and I can always rely on his stinky kisses. Jax is truly my favorite cub. And, he knows it.